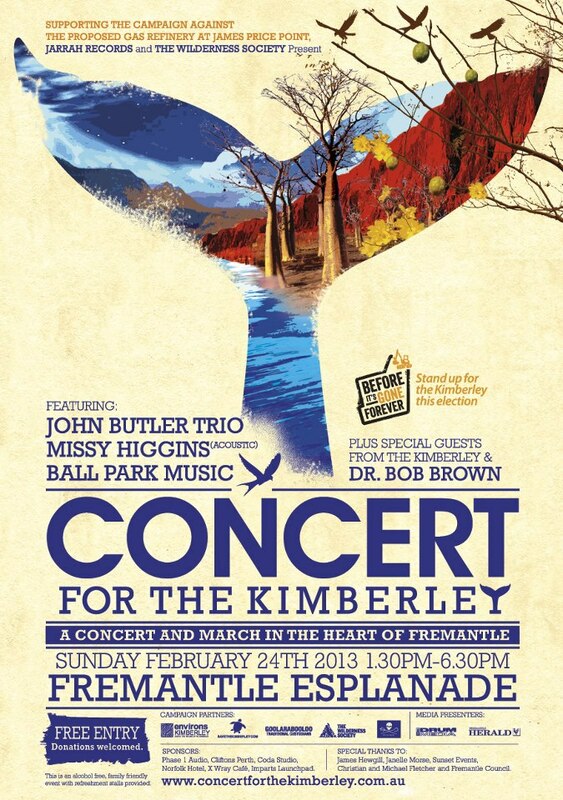 This Sunday, February 24th 2013 in Fremantle there is a protest meets performance concert on the Esplanade. Running from 1.30pm to 6.30pm, this concert features great artists such as Missy Higgins, John Butler, Ball Park Music and more. This is to raise awareness of the proposed James Price Point Gas Project in the Kimberley. The event is hosted by Peter Rowsthorn and as well as these talented musicians performing, they will be making speeches outlining their thoughts behind this project going ahead in our beautiful Kimberley and the impact this will have environmentally and otherwise. Dr. Bob Brown will also be speaking. If you have an interest in this or even if you do not know much about it, this is a great opportunity to enjoy wonderful music whilst being informed about the impact of this proposed project going ahead. So head to Fremantle Esplanade this Sunday to enjoy great music in a beautiful setting and to be a part of this important protest.